Having completed the first session of scalp micropigmentation, you should feel more confident and less nervous. A week after completion your skin will have mostly healed and the pigmentation settled. These are a little quicker as you completed the prep work last time and the style agreed which enables the technician to get right back to work on your scalp micropigmentation solution. You may still have one or two questions and the technician will also have a clearer idea of the amount of work they will have to do when you return. The below will give you a good idea of what to expect at your second and third SMP sessions. Once you are back in the treatment room for the second time, the technician can examine your scalp. This will let them see the progress from the first session. In some cases there may be some slight fading. This is perfectly normal, however, and is easy to correct during the second session. The first session was all about getting the foundation of the SMP in place. This time the technician can concentrate on the detail. This includes darkening the shade of your pigmentation which will really bring out the treatment on your scalp. Also at your second smp session you will see your new hairline really take shape. 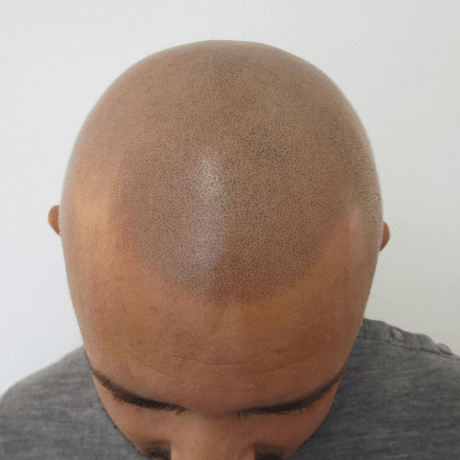 If you are not completely bald, scalp micropigmentation can seamlessly blend together with real hair. This is what makes the treatment so unique and tricks most people into believing you have a real shaved head. Similar to the first treatment, the pain level will only be noticeable at first. Very quickly it will not be painful at and any small discomfort you feel initially will quickly fade away. Before you begin your second session you can also make any final adjustments you want. This might mean lowering the hairline position, or a new style or shape. Depending on what you need, discuss this with the technician and they will do all they can to make sure you get want you want. Depending on how much work is required, the second session will take anywhere between 2-4 hours. Skalp always include 3 sessions for scalp micropigmentation. We would advise leaving a longer gap between the last two, usually between 3-5 weeks. This will allow your skin to completely heal and the pigmentation to settle on your scalp. The final session will be similar to the first two, but again with more attention to detail. Any small areas which are not quite perfect when settled will be corrected. You may also want to go a shade darker, which we are more than happy to help with if needed. After each session we will tell you avoid cutting your hair, using moisturiser or washing your scalp. This also includes doing any swimming for a period of up to 4 days, as well as exposing your scalp to direct sunlight. You can always see a full breakdown of our aftercare information here.